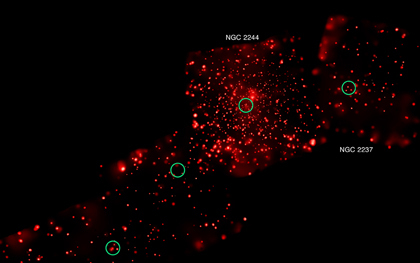 This work was led by Junfeng Wang of the Harvard-Smithsonian Center for Astrophysics. The co-authors were Eric Feigelson, Leisa Townsley, Pat Broos and Gordon Garmire from Penn State University, Carlos Roman-Zuniga from the German-Spanish Astronomical Center in Spain, and Elizabeth Lada from the University of Florida. Scale Image is 1 degree across (about 87 light years). Always amazed at the shots you transmit to us. I make sure I add each one to my library. Looks like a shark with its mouth open. Hi, I am definitely delighted to discover this great job. I am trying to reproduce this in an art work I am now undertaking, it is not possible to recreate something this spectacular, I will try. How are you? Just wanted to show my appreciation for your time and hard work. Besides this one, similar studies have been done on other nebulas too, like RCW 108 and W3. You can find more about these two, by clicking on their links under "Related Images". This is a very beautiful nebula and I was wondering if similar studies have been done on other nebula besides this one. All of these pictures make me realize how insignificant some of the things we deal with on Earth actually are. So beautiful, thank you. This is great stuff. Thank you. We do have that option on each image. If you click on the "Share This" icon in the upper right, the first clickable item you'll see in the pop up box is "Email". We hope that helps - enjoy! A light year is approximately 6 trillion miles. So multiply the 5000 light years by 6 trillion miles. I wish you could make the facility to e-mail each one of these website images to friends. I have one question, one comment. How do I calculate 5,000 light years into actual distance? did you notice in the black red image that the shape is nearly square? Amazing, really impressive, not to think that there is more life in the universe. I think this is going faster than I thought. From Spain a hug congratulations for this contribution to the humanity. 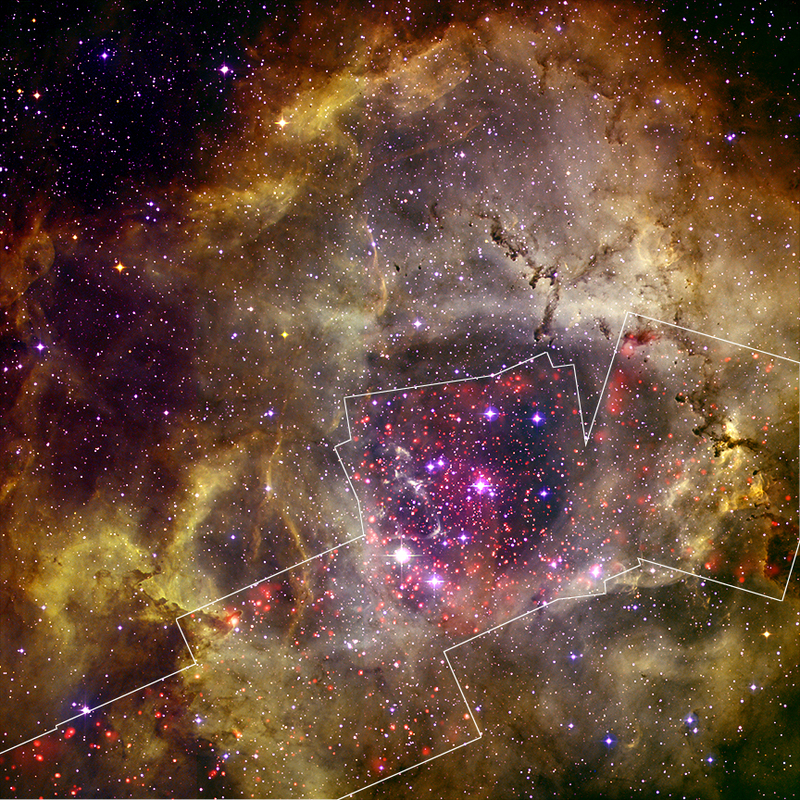 Rosette star formation region, located about 5,000 light years from Earth. About 5,000 light years Earth. 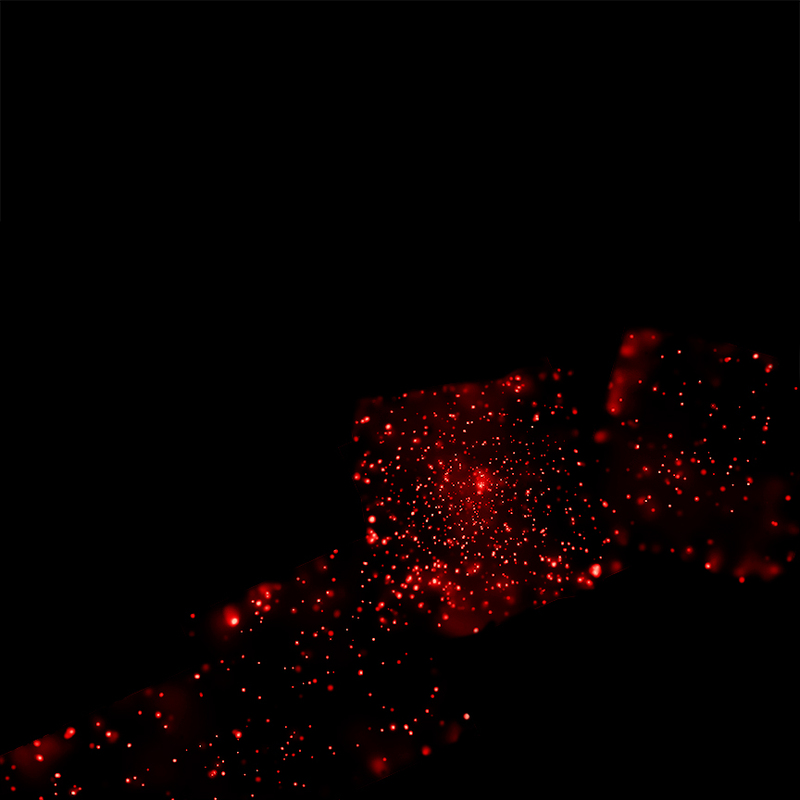 X-rays from Chandra and optical data from the Digitized Sky Survey and the Kitt Peak National Observatory. About 87 light years across. X-rays are red and the optical data are purple, orange, green, blue. In the constellation Monoceros (Unicorn), visible in both hemispheres.